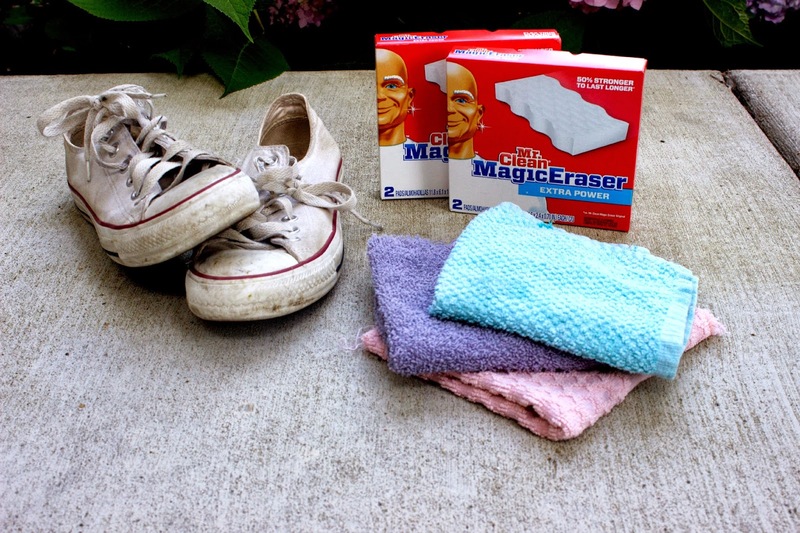 How to clean White Converse, Vans, TOMS, and any other canvas shoes in need of a touch-up. We all have that pair of shoes that takes us just about everywhere, and these Converse were those shoes for me. From baseball games to the weekend Farmer’s Market, they tread miles upon miles through heat, sun, puddles, snow, mud, etc. You name it, these shoes have been in it. Heck, they’ve even been in my dogs grip a few too many times. I think the funniest thing about them is the fact that I actually tried to give them this “lived in” look last year. I spent good time and energy jumping into mud puddles to get these stains! Am I completely crazy for that? 1) Start out by wetting the Mr. Clean Magic Eraser in warm water and then gently wring it out (you don’t want to tear it!). At this time you can also remove the laces and set them aside. I suggest starting at the smooth parts of the sole and then moving into the rougher parts of the rubber, but don’t be afraid to get in there and scrub away! 3) We save scrubbing the canvas and laces for last here because it begins to tear the Eraser, but it’s still necessary in most cases. I suggest only scrubbing the large, dark stains with the eraser; don’t worry if they don’t completely come out, the washing machine will take care of most of it! Plus, you can always come back in afterwards and scrub again with the eraser. 4) Let’s get suds-y! Nows the time to turn on the washing machine and give these shoes a spin! Turn the water on the HOTTEST setting for the standard time setting (we scrubbed out most of the set-in stains with the eraser prior, so the hot setting shouldn’t make them permanent!). I BEG YOU, DO NOT USE BLEACH. BLEACH IS THE DEVIL. Okay, bit of an exaggeration, but seriously, DO NOT USE IT. 5) Pour in the detergent, shoes, and laces, and letter rip! 6) Do your nails because, odds are, it’ll be quite a few minutes before the times up – try this gorgeous Essie nail color here, I’m loving it for summer! 7) Once the washing machine is done running place the shoes and laces outside in the sun until dry – placing them in the sun helps bleach and whiten them further. 8) Re-lace your shoes and show them off! You worked for those puppies to shine! Don’t be afraid to give them a spin either. After all, now you know how to make them look like new if they ever get dirty again! If you try this out, be sure to share it with me on Twitter (@ExtraordinaryOX) and Instagram (@ExtraordinaryFashionBlogger). I’d love to see how it turns out and works for you! Great tips, cleaning sneakers can be a really dificult thing sometimes! These are great tips…. now I just need a pair! 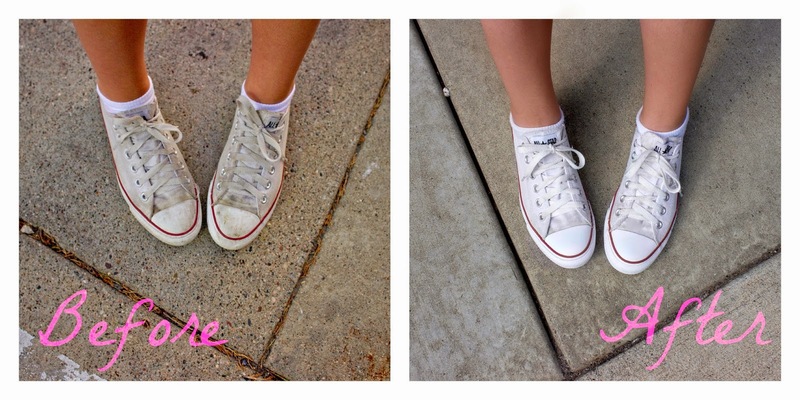 My all stars look so dirty..
Great advice, thanks for sharing!! I thought the only way to clean them was putting them in the washing machine.